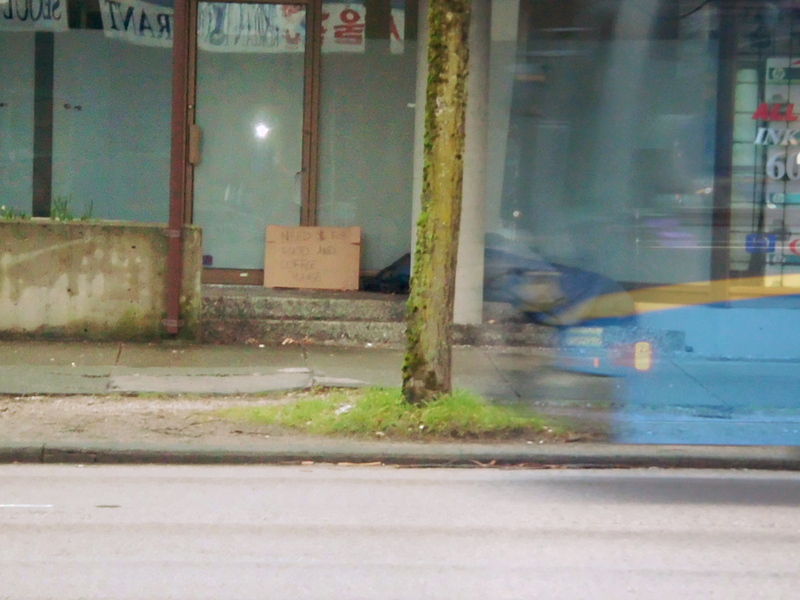 homelessness, rough sleeping, Vancouver B.C. Some people would think there was trash lying on those steps—even if you told them it was really a sleeping homeless person. 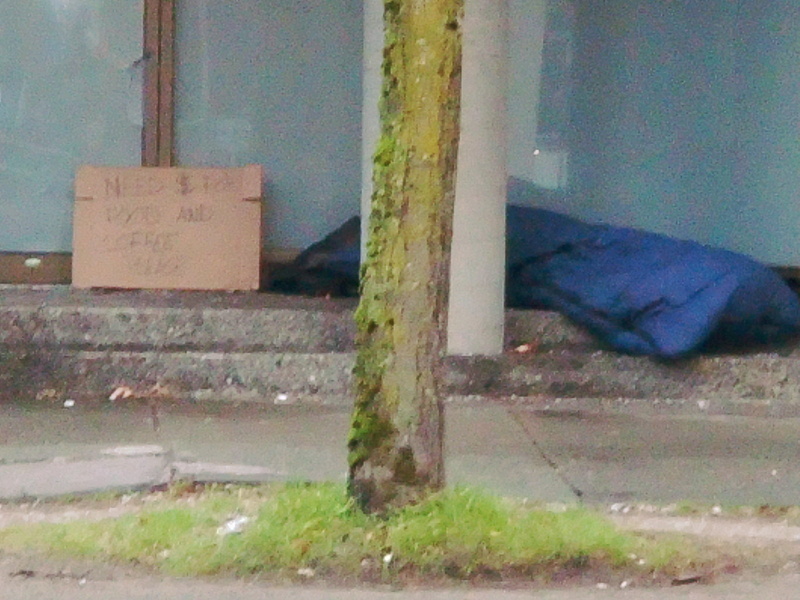 This morning (March 8th), a homeless rough sleeper occupied the covered walkway in front of the now empty ground floor offices on the southwest corner of West Broadway Avenue and Alder Street. This was likely the same homeless person who has been intermittently sleeping in the spot for months—since long before the Heart and Stroke Foundation of BC and Yukon—long-time tenant of the ground floor office space of 1216 West Broadway—unexpectedly (to me at least) cleared out in January or February. 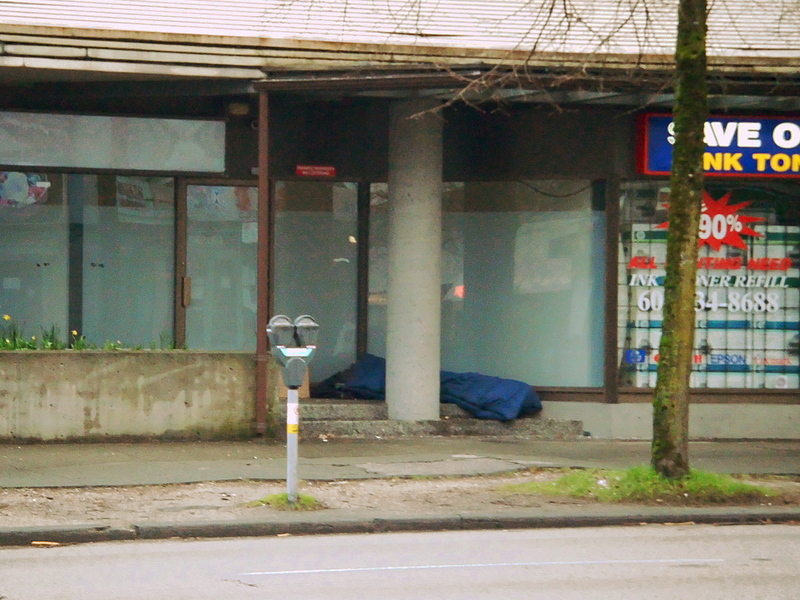 I paused at about 7:30 a.m. to consider the sight as I was heading from my own homeless sleeping spot towards breakfast at a fast food restaurant at the intersection of West Broadway and South Granville Street. Let sleeping homeless people lie—the sleep-deprived are grumpy! As a bus passes, you can see the cardboard sign that helps underscore the easily overlooked fact that there is a person under there somewhere. The obviously empty ground floor offices and the admittedly dishevelled look of the 38-year-old concrete building conspired with the haphazard way that the sleeping bag was draped across the concrete walkway and steps to give a first impression of neglect. The sleeping bag, I thought, could easily be taken for garbage that someone had thoughtlessly dumped there. There was no paper takeaway cup, or upended baseball cap where passers-by could leave spare change. But clearly the sign was soliciting money. It then occurred to me that beyond being a panhandling sign it could also be serving as a sign of life. This close-up of the sleeper and their sign isn’t very legible because I didn’t want to get too close and disturb them. Such a sign declares to anyone who can read—including City of Vancouver sanitation crews, who are inclined to see only the trashy side of city life—that there is no oversized garbage here that was inappropriately dumped on the doorstep of an empty and neglected premises and that needs to be collected and taken away to the landfill. No Ma’am! Rather, this is a real human being; someone with hopes and dreams (hopefully pleasant ones) who is sensibly trying to get a good night’s sleep (yawn). It only remains to wonder (if wonder we must) what circumstance have led them to choose this open spot on West Broadway as the best and safest place to get some shuteye. Click the images to enlarge them. « Davie Street trolley bus throws a shoe—sheer luck my friend wasn’t killed!